Side dish or dessert? I remember the first time I ordered a side of roasted acorn squash in a restaurant, and I commented on how it was more like dessert than an entree. The restaurant served it with butter and brown sugar, and I had no need for dessert after enjoying that treat. 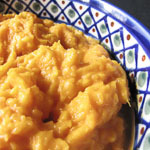 Though I like the sweet treatment with squash, for a meal I prefer a mixture of sweet and savory. 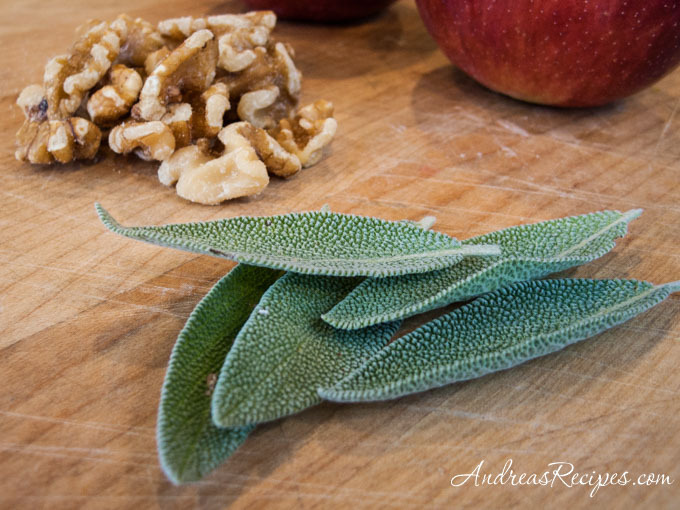 Sage is a good flavor to add to roasted squash, and I pulled some fresh from the garden for this preparation. Our sage is still going strong, though we’ve had some freezing nights, and I will have to cut it soon to freeze or dry for the winter. The boys kept peering through the oven window as the squash baked and they demanded tastes as soon as it came out of the oven, though I managed to hold them off for a few minutes explaining how hot it was. The whole time I was trying to get a photo of one half, they were raiding the other, nipping bites here and there. Sometimes the squash is slightly larger or has a very deep interior, in which case I make another half recipe of the apple mixture, and that was the case with this particular squash. There were even plenty of seeds for me to save for next summer’s garden. This is my contribution to Grow Your Own, a blogging event that celebrates the dishes we create from foods we’ve grown, raised, foraged, or hunted ourselves. Ning of Heart and Hearth is our host for this round, so be sure to visit her blog for more information about submitting your post. If you are new to the event, you can read more about the rules for participating at the Grow Your Own page. adapted from The Occasional Vegetarian, by Karen Lee. Center the oven rack and preheat the oven to 350° F/175° C.
Cut the acorn squash in half lengthwise and scoop out the seeds. Scrape the interior until all the strings are removed. Place face down on the prepared roasting pan and bake in the preheated oven for 30 minutes. While the squash roasts, stir together the diced apples, maple syrup, lemon juice, walnuts, sage, and cinnamon in the small bowl. Remove the squash from the oven and turn each half over. Portion the apple mixture between the two halves and drizzle a little more maple syrup on top. Return to the oven and bake for another 30 minutes, or until the squash is soft. Remove from oven and allow to cool slightly before serving. I grew up with just butter and brown sugar in them, but this sounds so good. I’ve given squash the brown sugar and butter treatment before, it’s good but this looks so much better! I’m not a fan of the brown sugar method as my mom used to make it this way all the time and I hated when the sweet parts ran out! I do think that I would like sage in acorn squash though. Thanks for the idea. 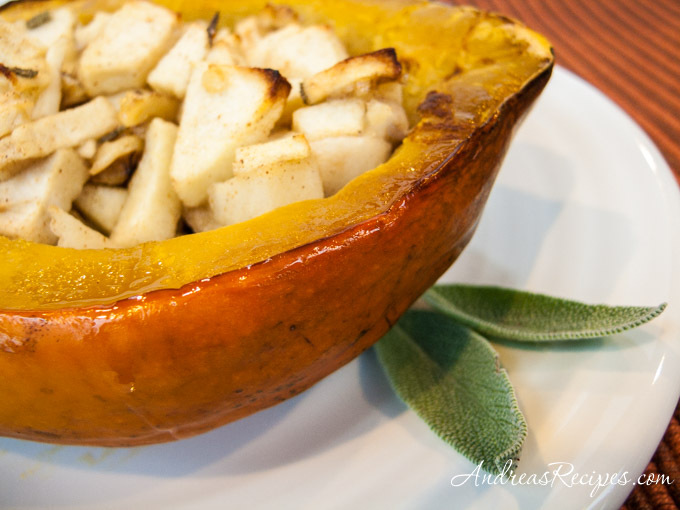 I love the combination of squash and apples — and your photo is absolutely beautiful. I’ve still got sage in my garden, and now I have another idea for how to use it. Thanks! hmmm… squash and apple. I’ve never combined them before. Thanks for a great idea! Yes Andrea! Gorgeous of the sage! I think I’m in love with the sage at the moment! It smells and tastes so lovely and then it has such wonderful color and texture for the eyes. Excellent with the apple and squash! The squash and apple sound so compatible. I grew up with the brown sugar, but also prefer my squash less sweet, so take advantage of our California location and use lime, chiles and cilantro. I also like how you can eat acorn squash, skin and all! 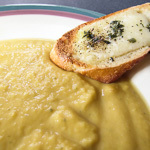 I am just wondering how to turn up the recipe with squash and apple so that it is a complete meal with a salad. Could you add ham, sausage to the stuffing? Any other ideas? Hi Diane. I think ham would taste wonderful with this since apples and pork go together well. 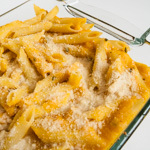 MMMMMMM….Recently I have made this lovely recipe & It was superb!